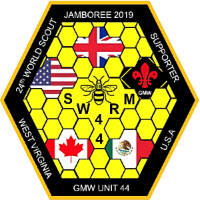 It is approaching 12 months now since the young people were selected from the County to represent GMW at the 24th World Scout Jamboree and the excitement is still evident. Each participant has to raise £3620 and various Unit, District, Group and individual fundraising events have been taking place including, bag packing, outdoor cinema nights, car wash, local fetes, providing refreshments at the Cardboard Canoe Competition and bucket collection at Manchester Storm Ice Hockey Match. Supporter badges are on sale at £3.00 per badge and can be obtained via our Facebook page Swarm 44 or from one of the participants attending the event. The mascot in the above image is Swarmzy. 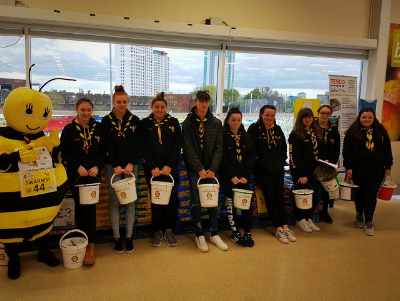 The young people are learning to work together and have had three Unit camps, a one day hike and during the summer they took part in the Bee in the City. The leaders are beginning to identify potential Patrol Leaders recognising the importance of getting a well balanced patrol to ensure that each young person gets the best experience. We have recently learned that our Big City Experience following the 10 days Jamboree Camp will be Washington DC and one of our eager parents is looking to get us an invite to the White House! We will continue to encourage the young people to plan a truly Youth Shaped experience for themselves over the next 9 months culminating with the trip of a lifetime of the sort that leaves young people with great memories and providing #skills for life.